If they are looking, fans of Diana Gabaldon’s “Outlander” series may easily see Fraser’s Ridge, Jamie and Claire’s North Carolina homestead, here around Blowing Rock. We certainly do! First of all, Diana Gabaldon herself once said that Fraser’s Ridge is up near Boone and Blowing Rock. It has been remarked before that North Carolina’s High Country strongly resembles the Highlands of Scotland- perhaps that is in part why this place would speak to the Highlander in Jamie. The two making their way to NC fits perfectly, as well, as Scottish settlers made their home in NC in large numbers in the mid- to late-1700s. In fact, many followed much the same path as Jamie and Claire, arriving at the port of Wilmington, and going through the town of Cross Creek (now Fayetteville). These settlers were among the largest groups to colonize the mountains of western North Carolina, with many more coming from northern routes from Pennsylvania. This rich connection to Scotland provides lots of historical context for, and possible connections to, people and places that Jamie and Claire would have known. It would also appear that Blowing Rock was a recommended destination for Sam Heughan, who portrays Jamie Fraser in the STARZ television series. Heughan posted a photo of himself in Blowing Rock on a foggy day in November 2016 to Instagram with the caption, “Go to Blowing Rock, Diana said… It’s beautiful, Diana said… Nothing like Scotland, Diana said… #rain #FindingFraserRidge 😳🌧🌩⛈☔️💦💦💦💦” The rain was unfortunate; someone please tell Sam that we have pretty days, too! He recently mentioned this visit in an interview while talking about the upcoming season four of the tv series, commenting that he came to see the Fraser’s Ridge area. 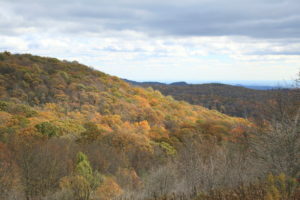 The mountains surrounding Blowing Rock are still largely undeveloped, protected by the boundaries of National Forests and National Park lands. Even now, it’s so easy to look out over the views and imagine Fraser’s Ridge, to envision rustic cabins tucked into the hills. It’s no great stretch to think of Jamie asking Claire if she would like to settle with him in those hills. 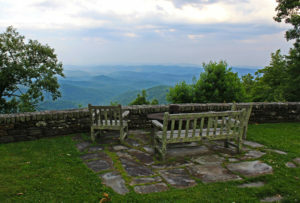 Blowing Rock is the perfect hub for an inspired adventure- book your stay and get to exploring! So where should you go to find your Fraser’s Ridge in Blowing Rock? Check out these locations and activities! 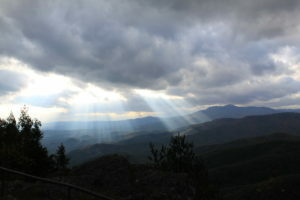 Blowing Rock is on the Blue Ridge Parkway, a unit of the National Park Service. Along the Parkway, dubbed America’s Favorite Drive, you can enjoy countless views, trails, and historic locations. 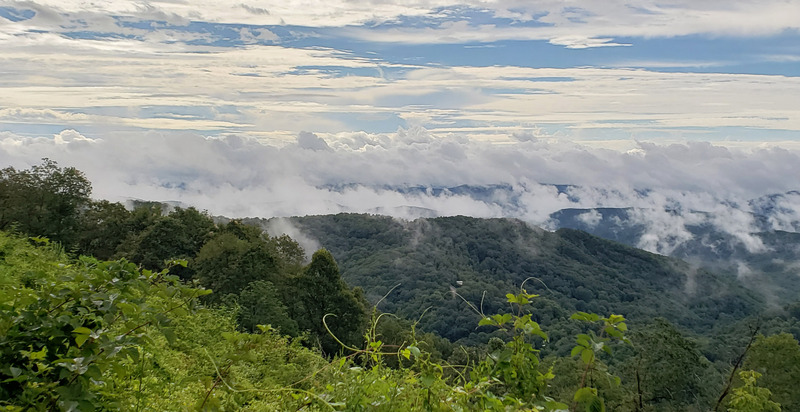 For a breathtaking view of the very area that could have been home to Fraser’s Ridge, we recommend Thunder Hill Overlook and Yadkin Valley Overlook, both just north of Blowing Rock on the Parkway. Portions of the NC Mountains-to-Sea Trail are accessible nearby along the Blue Ridge Parkway, too. How fitting to take a hike along a route that connects the ocean to the mountains, while thinking of possible paths Jamie and Claire would have traveled on their journey from Wilmington to Fraser’s Ridge! There are many more trails available from points on the Parkway, like Tanahwa Trail, Boone Fork Trail, and Green Knob Trail. See more local hiking information here. Head north along the Blue Ridge Parkway from Blowing Rock to view a cabin built sometime before 1840, a structure surviving from the very homesteads that early Blue Ridge settlers built. The Jesse Brown Cabin is accessible by following a 1/2 mile trail from Tomkins Knob Overlook at milepost 272.5 (for reference, Blowing Rock is at milpost 294). Two more beautiful historic cabins, albeit built later toward the end of the 1800s, are located further north in Doughton Park, at milepost 241. Brinegar Cabin is just along the Parkway, and features demonstrations and events. Caudill Family Homestead is found by hiking into Basin Cove. Camping is available at Doughton Park. 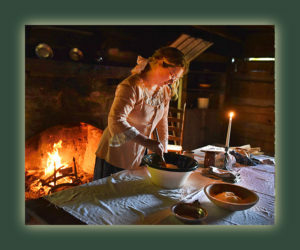 For a more immersive experience in what life might have been like in the mountains when Fraser’s Ridge was settled, visit the Hickory Ridge Living History Museum in Boone. A set of historical cabins and buildings are staffed with interpreters in Revolutionary period clothing. Demonstrations of skills like hearth cooking, blacksmithing, and candlemaking offer insights into life of the time. On the second Sunday of October each year, Hickory Ridge hosts the Boone Heritage Festival, celebrating Appalachian heritage with 18th century living history demonstrations, craft vendors, music jam sessions, children’s activities, live music and storytelling. The grounds are right next to Horn in the West. An outdoor Revolutionary War drama, Horn in the West tells a story of a family and their journey in the Blue Ridge, along with Daniel Boone and Cherokee allies. Shows are presented Tuesdays-Sundays between late June and early August. Gates open at 7:30, and you can enjoy the Hickory Ridge Living History Museum starting at 5:30pm on show nights! 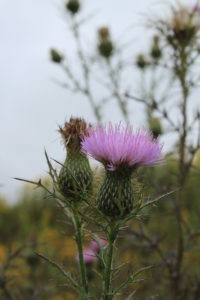 With an impressive collection of native trees, shrubs, and flowers, the Daniel Boone Native Gardens offers a close-up look at plants that make their home in the Blue Ridge, and so would have been found at Fraser’s Ridge as well. With Claire’s medicinal use of many plants in the series, you might find yourself curious about wild plants. The Gardens feature several plants that have medicinal history, including a few mentioned in the books like boneset and witch hazel. 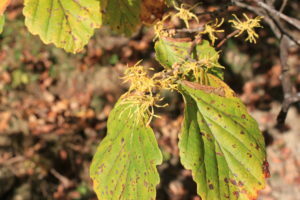 Did you know that witch hazel blooms very late, sometimes in November? It can be found all over the area if you know how to identify it. Travel the trails of the Blue Ridge in the way that Jamie and Claire would have: on horseback. 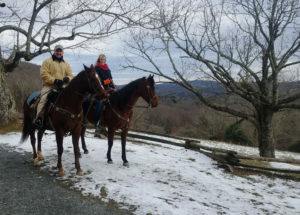 One very excellent trail riding service is Vx3 Trail Rides here in Blowing Rock. The guide, Tim, leads riders on the carriage trails of Moses Cone Memorial Park. This trail network, while close to town, feels worlds away- lined with ancient rock walls, passing idyllic lakes, and leading to wide, wide views of the Blue Ridge Mountains. Tim is exceedingly entertaining and informative, too, and he is always happy to oblige any questions with history and yarns from times past. He might even point out his idea of the location of Fraser’s Ridge. Among the largest gathering of Scottish Clans in the world, the Grandfather Mountain Highland Games is presented in early July of each year in nearby Linville. Annual attendance is around 30,000 over four days. Grandfather Mountain and the surrounding area evoke the Scottish Highlands, and offer a truly special setting for the cultural assembly. The Games feature plenty of demonstrations of strength at McCrae Meadows, and the lovely sounds of bagpipes in every corner. Clan tents are erected around the Meadows, with members offering information on family histories and lineages. Perhaps the most moving portion of the event is the Torchlight Ceremony and Calling of the Clans on Thursday night. It will give you chills! An impressive collection of Native American Artifacts is housed at Mystery Hill in Blowing Rock. The collection hails from 23 states, and includes an incredible array of arrowheads. As Jamie and Claire navigated new landscapes in America, they often met families that had been here long before any immigrants set foot on the continent. Stop in to take a look and appreciate a few pieces from that history. A quick search for musical performances before a visit will usually turn up some great options! Come find your Fraser’s Ridge in Blowing Rock! While you’re here, enjoy acclaimed restaurants and lodging (some with great views), adrenaline-pumping recreation, and relaxing spas, too. Downtown also features great boutiques, an impressive Art & History Museum, and loads of southern charm. Check the main menu for more details! Interested in more regional Revolutionary-period history? About an hour from Blowing Rock near Elizabethton, TN, lies Sycamore Shoals, an incredibly significant site. The first majority-rule system of American democratic government was chartered there in 1772 with the Watauga Association. It’s also the location of the Muster of the Overmountain Men prior to the Battle of King’s Mountain. Visitors will also find Fort Watauga, trails, and a museum with immersive exhibits featuring the lifestyles and ways of the Natives that first settled the Watauga River Valley. There are multiple cultural and historical events throughout the year. Sycamore Shoals is part of the Overmountain Victory National Historic Trail, which traces the route used by patriot militia during the pivotal Kings Mountain campaign of 1780. Points of interest also include Fort Defiance, just south of Blowing Rock in Lenoir. The Overmountain Victory Celebration happens each September (2018 date: September 14-17), with living history activities and re-enactments. Held at the Museum of North Carolina Minerals in Spruce Pine, the location is south of Blowing Rock on the Blue Ridge Parkway, about an hour away. Old Salem is a Moravian settlement founded in 1766. The town is near modern-day Winston Salem, less than 2 hours east of Blowing Rock. Interpretive staff in costumes provide living history demonstrations of life in the 1700s and 1800s, producing tools, food, furniture and more using traditional eighteenth and nineteenth century practices. About three-quarters of the Historic Town buildings are original structures. Visit the very place that Jamie and Claire went to make purchases and trade! Whippoorwhill Village contains more than 12 historic buildings and cabins. They are from various locations, having been saved, moved, and restored. Daniel Boone Day is celebrated each September, with demonstrations, music, & food. The Outlander Series, written by Diana Gabaldon, is published in the US by Random House publishing. The television series produced by STARZ begins its fourth season in late 2018.